This article is about the city. For the hold, see Whiterun Hold. Whiterun is a major city located in the center of Skyrim, to the northwest of the Throat of the World, the highest mountain on the entire continent of Tamriel. The capital of Whiterun Hold, Whiterun's central location makes it the province's major commercial hub. 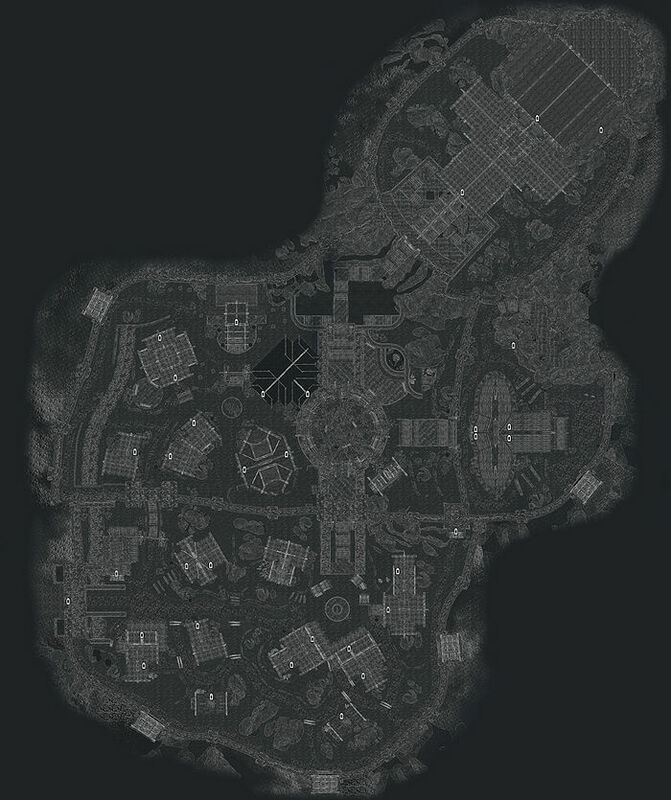 Its central location also makes it a crucial strategic point in the Civil War between the Imperial Legion loyalists and Stormcloak rebels, as control of Whiterun Hold grants access to all the surrounding areas. 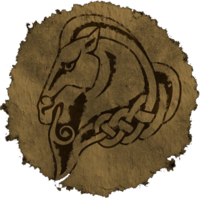 Initially, Whiterun is nominally aligned with The Empire, but the Jarl, Balgruuf the Greater, seems to care more about the people of Whiterun than either side of the conflict, and so the hold is effectively neutral. Whiterun comprises three districts arranged in tiers and connected by stairways. The Plains District is the lowest and contains all the shops, the city's marketplace, inns, and a few homes as well at the city gates. The Wind District is the main residential area; its more important buildings include the Temple of Kynareth and Jorrvaskr, headquarters of the Companions. The Cloud District is the location of Dragonsreach and is the highest point in Whiterun. Local businesses and services in Whiterun include: the Warmaiden's smithy and weapons store, The Drunken Huntsman tavern and hunting supply store, Belethor's General Goods store, the Arcadia's Cauldron alchemy store and The Bannered Mare inn. The Jarl's Palace, Dragonsreach, is the center of political matters and law enforcement, housing Dragonsreach Dungeon below. The Jarl's court wizard Farengar Secret-Fire also resides here and has spells and enchanting supplies for sale. He can also teach you the basics of enchanting. 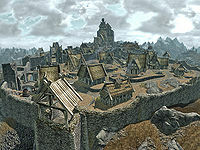 The Companions are based in Whiterun, as the city itself was established and expanded around their mead hall, Jorrvaskr. The Skyforge is worked by the greatest blacksmith in Skyrim, Eorlund Gray-Mane, who forges weapons and armor for the Companions. This ancient forge predates even Jorrvaskr and is said by Eorlund to produce the finest steel found anywhere in Tamriel. For more information about Whiterun, see the lore article. * Only appears after Dragon Rising. ** Only appears after the Stormcloaks quest Battle for Whiterun. *** Only appears after the Imperial Legion quest Message to Whiterun. **** Owns Chillfurrow Farm but sleeps here. † This person only sells goods at the market. †† Backup innkeeper for Hulda; also backup merchant for Belethor. Breezehome is a house available for purchase upon completion of the Bleak Falls Barrow Quest. It may be purchased from Proventus Avenicci for 5000 gold, as a reward for retrieving the Dragonstone for Jarl Balgruuf's court mage, Farengar Secret-Fire. If it is not purchased at this point, and Whiterun is conquered by the Stormcloaks, it may be purchased from Brill as a reward for helping the Stormcloaks conquer Whiterun. Bleak Falls Barrow: Retrieve the Dragonstone. Dragon Rising: Investigate a dragon sighting near Whiterun. The Whispering Door: Investigate Nelkir's story of a Whispering Lady behind a locked door. The Blessings of Nature: Restore the Gildergreen for Danica Pure-Spring. In My Time Of Need: Find a Redguard woman who is on the run from Hammerfell. Missing In Action: Rescue a missing Stormcloak supporter from the Thalmor. Adrianne Avenicci Warmaiden's Greatsword for a Great Man: Adrianne asks you to deliver a sword to Proventus Avenicci, her father. Andurs Hall of the Dead Andurs' Arkay Amulet: Retrieve Andurs' Amulet of Arkay from the catacombs. Brenuin The Bannered Mare Argonian Ale Extraction: Brenuin longs for the taste of Argonian Ale. Can you steal some for him? Farengar Secret-Fire Dragonsreach Salt for Arcadia: Farengar asks you to deliver some frost salts to Arcadia. Lars Battle-Born Whiterun Bullying Braith: Convince Braith to stop bullying Lars. Each white dot (or pog) corresponds directly to a door. All doors are numbered and relate to a Key on the side of the map. If you sprint as soon as you fast travel to Whiterun, the game may freeze. If Whiterun is taken by the Stormcloaks, two guards will spawn on the left side of the main gate instead of one on either side. It is possible to leave the city without using the main gate by jumping on a barrel and over a wall near the gate. This page was last modified on 26 July 2017, at 22:17.